Tucked away, among the rolling hills of West Marin County, sits the quaint village of Nicasio. Nicasio, which means "the hidden one". is a town that has been unspoiled by time. The town, which had its beginnings somewhere around the mid 1800s, has seen people come and go, yet has not lost many of the characteristics that it possessed approximately one hundred and fifty years ago. Located at the exact center of Marin County, Nicasio still retains a vast amount of land that has seen slow and gradual progress. These changes have not disturbed the tranquility that the town still possess. 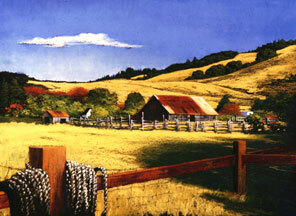 The early beginnings of Nicasio were led by pioneers. Cattle grazing, saw mills, and fishing became the top industries. Nicasio became a thriving town and the Hotel Nicasio was built in 1867 to accommodate the influx of new people. Traders would come great distances and spend time at the hotel to bargain for cattle and timber. The hotel's twenty two rooms were virtually filled to capacity by traders and San Franciscans, who spent weekends and vacations in the pleasant and peaceful valley. The boom of Nicasio faded with the advent of the railroad and the hotel burned down shortly before WWII on December 15, 1940. One year later, Rancho Nicasio was built where the hotel once stood and once again became the meeting place for the townspeople. The town square consists of Rancho Nicasio, St. Mary's Church (est. 1890), a general store, post office and a volunteer fire department. Nicasio has retained its rural atmosphere and tranquil beauty. The community still looks like a frontier town, a place where change is slow and predictable. The town gradually drifts through time, at an unnoticeable rate and will most likely boast those characteristics for many years to come.